Folk painting is assuredly the oldest traditional art still being created in India. The earliest examples - images of animals and hunters found on rock shelters in the region of modern Bhopal in central India - date back more than seven thousand years. The Indian folk paintings presented here still carry the lively imprint of ancient and inventive minds. 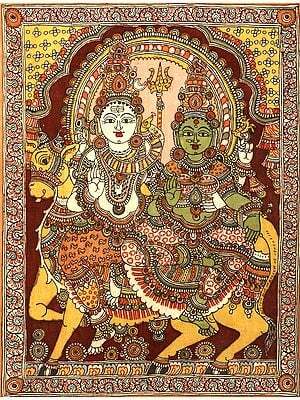 Folk Paintings are living traditions, which can be classified into two categories: those that are executed on ritual occasions for the express purpose of "installing" a deity, and those that are essentially narrative in character, the themes of narration being primarily from the ancient Indian epics. These may be executed on a wall (bhitti-chitra), on a canvas (pata-chitra), and on the floor (bhumi-chitra).' Sometimes the twin functions of Indian folk painting, the magico-religious ritual and narration, overlap. "Magic diagrams", or auspicious symbols, outlined on the floor, in rice paste and/or coloured powder are executed by women almost all over India, form the major iconography of India folk paintings. These designs are known as kolam in South India, mandana in Rajasthan, rangoli in Maharashtra, sathiya in Gujarat, alpona in Bengal, aripana in Bihar, apna in the western Himalayas, chowka purna and sona rakhna in Uttar Pradesh, osa in Orissa and aripona in other parts of northern India. These line drawings are potent receptacles of cosmic powers that are essentially benevolent and protective in nature. Folk painters in India have employed traditional ornamentation in their work. They have done so not so much to beautify their paintings but to more fully express their devotion to their deities. While Indian folk artists have created works pleasing in color and design, in no instances have they intended to make paintings "for art's sake" or for aesthetic reasons alone, that is, primarily to be put on a wall or other support and admired as beautiful visual form. An enormous stylistic range is evident among the traditions and types of Indian folk painting presented here, from bare essential contours to painstaking, miniature-like rendering of details to the precise, geometrized figural abstractions reminiscent of India's prehistoric painting. It is the goal of this collection of Indian folk painting to capture something of the amazing spectra of the etarnal tradition of Indian folk art, and to provide a framework for understanding its motives and iconography. Folk Paintings have been selected here for their aesthetic appeal as well as for their representative value, and, wherever possible, to show the evolution of a tradition and even the contrasts within it.